Esthetic rehabilitation of anterior teeth in young children is a common sight in a dental clinic. Most of these young children report with rampant caries, nursing bottle caries, and fractured tooth due to trauma in the anterior region or even cases of dental caries. A major component while restoring anterior teeth is esthetics, being an important factor, especially in children as it affects their self-esteem and confidence. Also, in children, it can be challenging due to the smaller size of tooth, larger pulp chambers, and not-to-mention issues related to child behavior. Over the years, many types of crowns have been developed and advanced to aid the clinician in rehabilitating deciduous anterior teeth. Esthetic rehabilitation of badly decayed primary anterior teeth is a challenging task. A clinician needs to restore the tooth esthetically and also manage a young child's temperament in a clinic. Due to their young age and still developing cognitive skills, it is very hard to presume that a child is going to be the most cooperative in a dental clinic. The most common condition that affects a child's anterior teeth is due to dental caries seen in the form of nursing bottle caries. It is usually detected in children from 18 to 36 months. The restoration for anterior primary teeth needs to be durable, esthetically pleasing, retentive, and strong as it is need for a duration of approximately 8 years until the primary teeth begin to shed. Anterior teeth are used to be treated with primarily preformed polycarbonate crowns, acid-etched resin crowns, and stainless steel crowns. ,,,, However, each came with their own set of advantages and disadvantages which brings us the development of newer type of crowns to replace primary anterior teeth. Stainless steel crowns [Figure 1] are one of the earliest crowns used in dentistry to restore teeth. Introduced by the Rocky Mountain Company in 1947 and popularized by W. P. Humphrey in 1950, they have proved to have high strength, durability, and wear resistance. However, they are highly unesthetic due to its color. Two modifications of these types of crowns are the resin-veneered stainless steel crowns and the facial cut-out stainless steel crowns. Facial cut-out stainless steel crowns or open faced stainless steel crowns have composite material substituted in the facial surface of the crown to prevent the unsightly silver color of steel. Although composite is placed anteriorly, the metal margins are still seen and the procedure to fabricate the crown is time consuming. Resin-veneered stainless steel crowns, on the other hand, have thermoplastisized composite resin bonded to the metal. Examples of these types of crowns are the Cheng crowns, Kinder Krowns, NuSmile, Whiter Biter, Pedo Compu crowns, and Dura crowns. Cheng crowns are developed by Peter Cheng in the year 1982. They are stainless steel crowns faced with composite, mesh-based with a light-cured composite. They can be used for all anterior and posterior teeth. Cheng crowns have desirable properties such as color stability, plaque resistance, and can undergo heat sterilization without affecting its bond strength and color. It can also be delivered to the child in a single visit. However, they are very costly and during crimping, they often fracture. There are two variants which are the classic crowns  and the zirconia crowns. The classic crowns [Figure 2] have a resin veneered to a stainless steel coping while the zirconia crown [Figure 3] is a precision-milled monolithic ceramic crown which is virtually indestructible. While zirconia crowns are not crimpable like the classic crowns, they are precrimped to give a crimplock retentive margin to give a more natural emergence profile. Zirconia crowns have to be sterilized by autoclave while the classic crowns have to be cold sterilized. 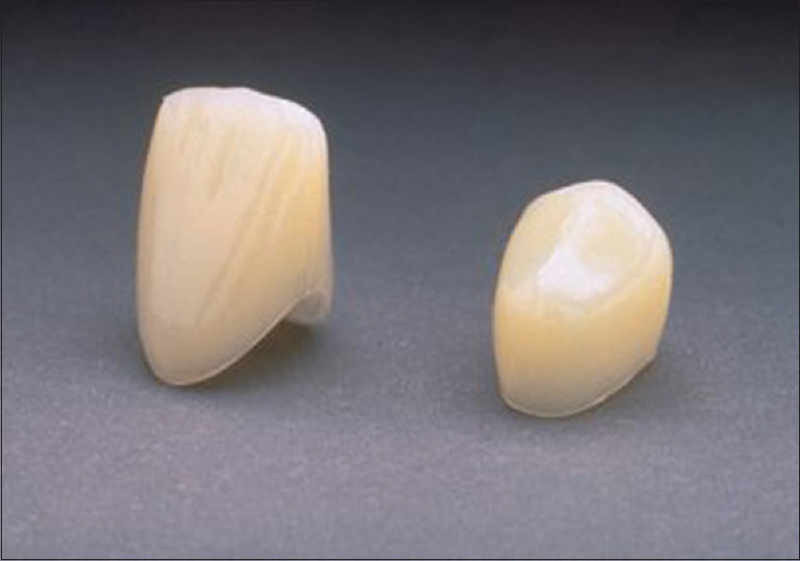 Dura crowns are made of a high-density polyethylene veneered crown. Dura crowns have the advantage of higher retention compared to nonveneered crowns when cement and crimping are combined. These crowns can be crimped labially, lingually, and can be trimmed with crown scissors and festooned. It also has a full knife edge. Kinder Krowns were introduced in 1989 and are known for offering the most natural shades and contour for the patient. Kinder Krowns aims to provide the most natural, lifelike, and anatomically correct crown as possible. They have a highly characterized incisal edge, scientifically developed shades, and finely feathered margins. The finely feathered margins help create an esthetic emergence profile. These crowns are available for anterior and posterior teeth and they come as zirconia Kinder Krowns or a preveneered Kinder crown. Zirconia Kinder Krowns have an internal retention system in the form of retention bands which locks the restoration to the tooth after cementation. These retention bands also increase the total surface area for the cement to bond to both the tooth structure and the crown. The preveneered crowns are less time consuming to use and comparatively less technique sensitive. It has a strengthened stainless steel crown with feathered margins. It comes in two different lengths which is the regular length and short length for clinicians to choose based on their tooth preparations. The shades offered for the preveneered Kinder Krowns are Pedo 2 and Pedo 1 shade. Pedo 1 is a lighter-bleached shade compared to Pedo 2 while Pedo 2 gives a more natural look compared to the Pedo 1 shade. It has a universal contour, whereby the clinician is able to decide to make the crown a left or right by selectively rounding off the mesial or distal corner. Also, it has an incisal lock for better bonding and retention. NuSmile crowns  are introduced in the year 1991 [Figure 4]. They are also made of stainless steel with an even more natural appearing tooth-colored coating. They are indicated for full-coverage restorations when a crown is needed for durability and to protect remaining tooth structure. They come in two styles which are the NuSmile Signature and NuSmile ZR. The NuSmile Signature crowns are anatomically correct with a natural tooth-colored coating which is an alternative to the traditional stainless steel and composite strip crowns. NuSmile ZR, on the other hand, is made from a high-grade monolithic zirconia ceramic which offers superior esthetic and durability compared to the NuSmile Signature. NuSmile crowns come in a universal style where the anterior crowns are fabricated with both point angles slightly square. The clinician may round off either angles to make it a right- or left-sided crown. They come in extra light or light pedo shade. Light crowns are comparatively more yellow compared to the original pedo shade. These crowns have a polymeric coating with polyester/epoxy hybrid composition. Although the coating is thin, it does not peel or chip easily. EZ Pedo crowns were developed by Dr. Jeffrey P. Fisher and Dr. John P. Hansen. They are metal-free prefabricated crowns which are made of zirconia. They have superior esthetics, strength, durability, and are completely bioinert. It is also resistant to decay and plaque accumulation. EZ Pedo crowns is constructed with a Zir-Lock ® ultrafeature which functions to increase the internal surface area to increase bonding. This is because zirconia does no flex, so inherently there will be areas in the subgingival margin where the crowns are open. The Zir-Lock ® ultrafeature basically provides mechanical undercuts that lock the crown in place and helps to retain cement at the crown margins to prevent cement loss, prevent microleakage, and also to keep harmful bacteria out. In addition to the in-built retention, then crowns are also treated with aluminum oxide blasting for additional adhesion properties. Pedo natural crowns are made of polycarbonate material and offer advantages such as higher flexibility, high durability with superior marginal integrity, and high tensile strength. Polycarbonate crowns  are another type of preformed full-coverage crowns which are made of heat-molded acrylic resin [Figure 5]. Polycarbonate preformed crowns are thinner and more flexible compared to acrylic resin crowns, making them easily adaptable to a prepared tooth. It has better esthetics, easy to trim, and can be adjusted with pliers. However, it has poor retention and its placement is difficult. These crowns are not advised to be used in cases where remaining tooth structure is insufficient for retention, bruxism, crowding, and overbites. Hence, these crowns are rarely used today. 3M TM ESPE TM Strip Crown Forms  are prefabricated transparent celluloid crowns forms for anterior teeth [Figure 6]. They are first introduced in 1979 by Webber et al. and today remains to be one of the most commonly used crown forms. The crown automatically contours the restorative material and when it is stripped off, it leaves a smooth surface, so no polishing is needed. The crown forms are filled with composite and then bonded to the tooth. Although esthetically they are better, its retention is dependent on the amount of tooth structure remaining after excavation of caries. Because resin composite is used, moisture and hemorrhage control is important as it can lead to resin placement failure. They come in 16 different sizes. The crown forms are made only for primary upper left and right central and lateral incisors and for each of these teeth, they come in four different sizes. Pedo Jacket crowns are introduced by Space Maintainers Laboratory, USA. The Pedo Jacket crown is made of a copolyester material in the natural primary tooth color shade A2. A important advantage of using Pedo Jacket crowns is that the tooth color polyester "jacket" which is filled with resin will be left on the tooth instead of removing it like a strip crown after polymerization. It is flexible and its length can be trimmed with scissors but not with high speed bur. This is the only flexible or soft crown option compared to the other crowns available on the market. Polishing is not required as the margins are finished before polymerization by removing excess material with a hand instrument. However, only a single size and shade is available, so shade matching with adjacent tooth will be a potential problem. Also, they exhibit wear in areas of heavy occlusion and they do not have good color stability. The most common failure seen is when the Pedo Jacket shell is stripped from the filling material with the filling material still attached to the tooth. There are a wide range of options that can be used to rehabilitate carious primary anterior teeth. Each of which comes with its own advantages. Thus, the choice of material is dependent on the clinicians preference, skill, and esthetic and functional demands of the child. Tinanoff N, O′Sullivan DM. Early childhood caries: Overview and recent findings. Pediatr Dent 1997;19:12-6. Mink JR, Hill CJ. Crowns for anterior primary teeth. Dent Clin North Am 1973;17:85-92. Grosso FC. Primary anterior strip crowns: A new technique for severely decayed anterior primary teeth. J Pedod 1987;11:375-84. Croll TP. Bonded composite resin crowns for primary incisors: Technique update. Quintessence Int 1990;21:153-7. Waggone WF. Restorative dentistry for the primary dentition. In: Pinkham JR, editor. Pediatric Dentistry: Infancy through Adolescence. 2 nd ed. Philadelphia: WB Saunders Co.; 1994. p. 298-325. Anuradha K, Bargale S, Shah S, Ardeshana A. Esthetic crowns in primary dentition - Reestablishing the innocent smile. J Adv Med Dent Sci Res 2015;3:46-52. Stainless Steel Crowns. NEXADENTAL; 2016. Available from: http://www.nexadental.com/stainlesssteel.aspx. [Last cited on 2016 Sep 13]. Lee JK. Restoration of primary anterior teeth: Review of the literature. Pediatr Dent 2002;24:506-10. Pediatric Stainless Steel Crowns | Cheng Crowns; 2016. Available from: https://www.chengcrowns.com/stainless-steel-pediatric-crowns. [Last cited on 2016 Sep 13]. Pediatric Zirconia Crowns | Cheng Crowns; 2016. Available from: http://www.chengcrowns.com/zirconia-pediatric-crowns. [Last cited on 2016 Sep 13]. Yilmaz Y, Guler C. Evaluation of different sterilization and disinfection methods on commercially made preformed crowns. J Indian Soc Pedod Prev Dent 2008;26:162-7. Babaji P. Crowns in Pediatric Dentistry. 1 st ed. New Delhi: Jaypee Publishers; 2015. NuSmile ZR. Zirconium Milk Front Tooth Crown Extra Light; 2016. Available from: http://www.kinderdent.com/nusmile-zr-milchfrontzahnkronen-extra-light-zum-nachbestellen.html. [Last cited on 2016 Sep 13]. Sahana S, Vasa AA, Ravichandra SK, Vijaya Prasad KE. Esthetic crowns for primary teeth: A review. Ann Essence Dent 2010;2:87-93. 3M™ ESPE™ Dental: Polycarbonate Crown; 2016. Available from: http://www.products3.3m.com/.../command_AbcPageHandler/output_html. [Last cited on 2016 Sep 13]. Strip Crowns | Miami Dental Supply - Miami Dental Supplies Supply; 2016. Available from: http://www.dentalacegroup.com/69-strip-crown. [Last cited on 2016 Sep 13]. Kupietzky A, Waggoner WF, Galea J. The clinical and radiographic success of bonded resin composite strip crowns for primary incisors. Pediatr Dent 2003;25:577-81. Yanover L. The Artglass primary anterior esthetic crown. J Southeast Soc Pediatr Dent 1999;5:10-2. 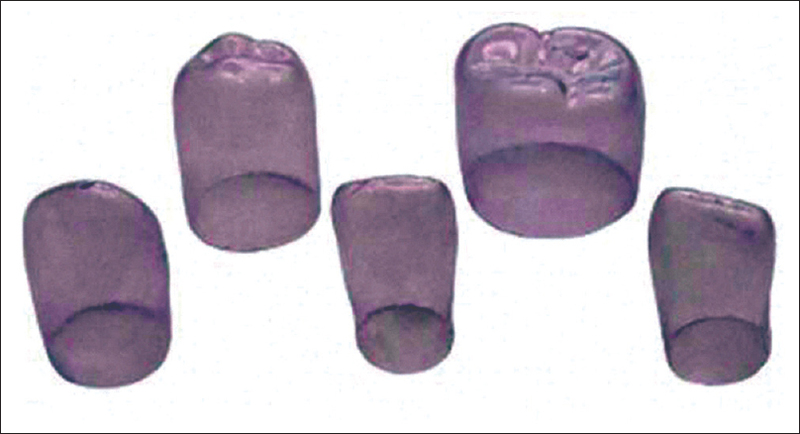 Updyke JR. Esthetics and longevity of anterior Artglass crowns. J Southeast Soc Pediatr Dent 2000;6:25-6. Updyke J, Sneed WD. Placement of a preformed indirect resin composite shell crown: A case report. Pediatr Dent 2001;23:243-4.